We’d love your help. Let us know what’s wrong with this preview of The Art of Breaking Things by Laura Sibson. Seventeen-year-old Skye has her sights set on one thing: getting the heck out of Dodge. Art school is her ticket out and she’s already been accepted to her first choice, MICA. All she has to do is survive her senior year, In the tradition of Laurie Halse Anderson and Sara Zarr, one girl embraces the power of her voice: rules are meant to be broken and she won’t stay silent. Seventeen-year-old Skye has her sights set on one thing: getting the heck out of Dodge. Art school is her ticket out and she’s already been accepted to her first choice, MICA. All she has to do is survive her senior year, not get too drunk at parties, and be there for her little sister, Emma. Sure, she’s usually battling a hangover when she drives to pick Emma up, but she has everything under control. Until he returns. Enter for a chance to win an advance copy of THE ART OF BREAKING THINGS by Laura Sibson! 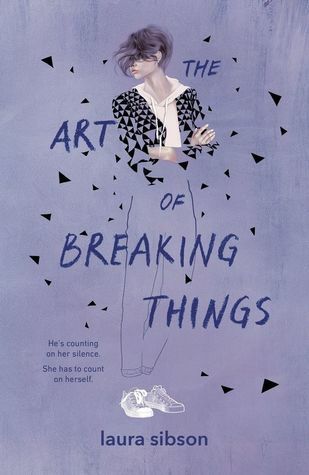 In the tradition of Laurie Halse Anderson Enter for a chance to win an advance copy of THE ART OF BREAKING THINGS by Laura Sibson! In the tradition of Laurie Halse Anderson and Sara Zarr, one girl embraces the power of her voice: rules are meant to be broken and she won't stay silent. But her party-first-ask-questions-later lifestyle starts to crumble when her mom rekindles her romance with the man who betrayed Skye's trust and boundaries when he was supposed to be protecting her. She was too young to understand what was happening at the time, but now she doesn't know whether to run as far away from him as possible or give up her dreams to save her little sister. The only problem is that no one knows what he did to her. How can she reveal the secret she's guarded for so long? To ask other readers questions about The Art of Breaking Things, please sign up. This is an absolutely incredible debut. It's a stunning and accurate depiction not only of the damage that sexual abuse creates, but how the subsequent ways of managing the secret trauma can render the victim less trustworthy in the eyes of those who love them-- and ultimately, renders them unwilling to trust themselves. Sibson makes Skye's world so real, every rent in the fabric of her life will leave you feeling as if your firmament is also torn, long after you've put the book down. In this mo This is an absolutely incredible debut. It's a stunning and accurate depiction not only of the damage that sexual abuse creates, but how the subsequent ways of managing the secret trauma can render the victim less trustworthy in the eyes of those who love them-- and ultimately, renders them unwilling to trust themselves. Sibson makes Skye's world so real, every rent in the fabric of her life will leave you feeling as if your firmament is also torn, long after you've put the book down. In this moment of time when we think we've discussed everything there is to discuss about the #metoo movement, Sibson brings so much more to the table. A difficult subject, yet brought to life with such joyful tenderness and characters that are a pleasure to know and love - The Art of Breaking Things is destined to become a groundbreaking classic. Characters: 5 Skye is an amazing character. She's so strong, but she feels like she has to be. Her secret eats her alive, and she does whatever she can to drown it with drugs or emotional outbursts. She's trying to cope the best she can without any resources and during her partying she has even more negative sexual experiences. From the outside, Skye looks like she's barely hanging on. Without knowing what she's working through she looks pointlessly rebellious. But she's not, and watching her best friend get sent to rehab after a party got busted starts to send Skye into a mission to deal with her own relationship with herself and her coping mechanisms. Ben was always there to get high with Skye until he isn't. Caught with weed on him during a party, heh disappears for a month leaving Skye to fester about whether their friendship really is becoming something more. It's a thought that terrifies her. They have palpable chemistry, and what turns into a beautiful relationship when he gets out and starts to help Skye when she's ready to open up. Luisa is another amazing character. She's been Skye's best friend forever, and she's always known something happened with Dan even though Skye has never been open to talking about it. But she does the best thing she can- she stands by Skye and supports her until she's ready to say something. Keith is another surprising character. While he starts as a total football bro, Keith turns into an amazing friend who helps support Skye during Ben's absence. I love seeing this friendship, and I love seeing Keith explore who he wants to be when social pressures are released. The family dynamics in the book are also super important. Her mother doesn't remember that night, but Skye does. She doesn't understand why Skye is so angry about why Dan is back, and she chalks her partying up to being an obnoxious, rebellious teenager. Being busy closes her off to her kids even though she does everything for them. Emma is navigating her own way into being a teenager and her honest sibling relationship with Skye is amazing. Plot: 5 This story is so so good. The beats hit perfectly, and there are so many layers. There are great scenes where the friends are just hanging out that fill your heart up, there are tense moments, and scenes that turn small, mundane things into everything. With a couple well used flashbacks and a couple scenes of pure emotion, Sibson captures Skye's rollercoaster of healing beautifully and with a delicate hand. THE ART OF BREAKING THINGS is a story I will not forget. Laura Sibson weaves a compelling story about a girl with a secret that too many young girls can relate to. Her character is hurt, but not broken, searching to find her way through the other side of trauma. Through her, I imagine so many others will find healing. What a fantastic debut. It's 12:11 AM and I just finished this after starting it a couple hours ago and I'm crying, is any more explanation even needed? I would throw all of the stars at this book if I could. The MC has the same first name as me -- of course I'm going to read it. Gritty, necessary and completely gripping! Laura Sibson worked for years as a career counselor for undergraduates before getting her MFA from the Vermont College of Fine Arts. When she’s not writing, counseling, or drinking impossibly strong coffee, you can find her running miles around her home in Philadelphia, walking her dog, or ingesting pop culture (along with great takeout) with her family.